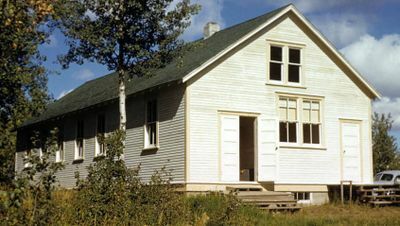 Tofield Gospel Church was started by Russian Mennonite immigrants that immigrated to Canada in the 1920s and settled at Trent Ranch, northeast of Tofield, Alberta. The group began services and formally organized in 1928 with 14 members. They met in family homes and, because transportation was difficult, not very frequently. In 1936 the Trent Ranch dissolved, and so many families moved to the Lindbrook area. In 1937–1938 many families from Crowfoot also moved the Lindbrook area. In 1939 they had outgrown family homes and so rented facilities were used for meeting places. In 1940 they decided to build their own meeting house between Tofield and Lindbrook, called the Lindbrook Mennonite Brethren Church. In the mid-1940s the Evangelical Mennonite Brethren congregation at nearby Ryley joined the church. In 1963 a larger meeting house was completed south of Tofield and the name of the congregation was changed to Tofield Mennonite Brethren Church. In 1971 the congregation adopted the pastor system. In 1977 the congregation again changed its name to the Tofield Gospel Church. In 1982 the congregation again built a larger meeting house north to Tofield. By 2005 the church was struggling. Grace Road Church, which had been formed by former members of Tofield Gospel Church, had closed by 2005. In 2006 the congregation was released from membership in the Alberta Conference of Mennonite Brethren Churches. Mennonite Brethren Herald (27 May 1988): 8. MB Herald (29 August 1997); (22 June 2001); (11 January 2002); (21 March 2003); (11 June 2004); (29 April 2005); (28 April 2006). Centre for Mennonite Brethren Studies, Winnipeg, MB: Volume 340, Reel 54. Thiessen, Richard D. "Tofield Gospel Church (Tofield, Alberta, Canada)." Global Anabaptist Mennonite Encyclopedia Online. March 2014. Web. 23 Apr 2019. http://gameo.org/index.php?title=Tofield_Gospel_Church_(Tofield,_Alberta,_Canada)&oldid=163581. Thiessen, Richard D. (March 2014). Tofield Gospel Church (Tofield, Alberta, Canada). Global Anabaptist Mennonite Encyclopedia Online. Retrieved 23 April 2019, from http://gameo.org/index.php?title=Tofield_Gospel_Church_(Tofield,_Alberta,_Canada)&oldid=163581. Adapted by permission of Herald Press, Harrisonburg, Virginia, from Mennonite Encyclopedia, Vol. 3, p. 349. All rights reserved. This page was last modified on 11 March 2019, at 01:47.